MOTM — John Kerry will visit Morocco for the first time as Secretary of State later this week, on the final stop of an April 1-5 tour to Brussels, Algiers, and Rabat, the State Department announced last week. Morocco confirmed that the US Secretary of State will be in Rabat for two days, April 4-5. While in Rabat, Secretary Kerry will co-chair the second meeting of the Morocco-US Strategic Dialogue with Moroccan Foreign Minister Salaheddine Mezouar, and also will meet with senior Moroccan officials to discuss a range of bilateral and regional issues. The Morocco-US Strategic Dialogue underscores America’s “close cooperation with Morocco and will focus on political affairs, economic and security cooperation, and educational and cultural issues,” said the State Department. This week’s meeting will provide an opportunity to consolidate “sound cooperation ties between the two countries” and further promote partnership in political, economic, social, educational and cultural fields, in line with the recommendations in the joint communiqué issued after the November 2013 summit talks between King Mohammed VI and President Barack Obama in Washington, said the Moroccan Ministry of Foreign Affairs and Cooperation. Kerry’s visit to Rabat comes as Morocco continues to move forward with its agenda of leadership for peaceful reform and progress in the region, including revisions to its military justice system to exclude civilians from military trial, providing greater protections for the rights of migrants, strengthening civil society and the ability to form associations, and a new model for development and local empowerment in Morocco’s Saharan provinces. Earlier this month, King Mohammed VI also completed his four-nation Africa trip, during which more than 80 agreements were signed to advance economic development, food security, trade, and religious cooperation to limit the spread of Islamic extremism in the region. In January, the King chaired the al-Quds Committee of the Organization of the Islamic Conference to bolster the recent US initiative to rebuild momentum in the Middle East peace process. 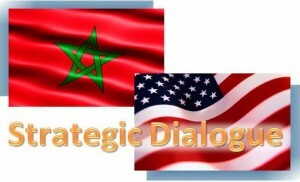 The Morocco-US Strategic Dialogue was first launched on September 13, 2012 in Washington, DC, where then-Secretary of State Hillary Rodham Clinton said that “the United States looks to Morocco to be a leader and a model” in a region where America needs a strong, reliable, and influential ally. “King Mohammed [VI] deserves great credit,” said Clinton, for Morocco’s strong record of reforms and commitment to change, highlighted by the 2011 Constitution. “But we’re not satisfied with simply having a friendship that is longstanding,” Clinton said. “We want one that is dynamic, growing, looking toward the future,” she said, calling the Dialogue an important tool to further strengthen relations and implement the shared Morocco-US vision for Africa and the Middle East. Building on achievements over the past decade — including the Morocco-US Free Trade Agreement, Millennium Challenge Compact, and Morocco’s designation as a major non-NATO ally — the Strategic Dialogue established a high-level forum to continue advancing common interests on political, economic, security, and educational and cultural affairs. Secretary Kerry and Foreign Minister Mezouar are expected to address these issues at their meeting in Rabat. In their joint communiqué, the two leaders reaffirmed the strength of the US-Morocco strategic alliance, which dates back to 1777 when Morocco was the first nation to recognize the US. The King and President Obama stressed the importance of mapping out “a new and ambitious plan for the strategic partnership” and pledged to advance their shared priorities for a secure, stable, and prosperous Maghreb, Africa, and Middle East, working to promote human and economic development, counter the spread of terrorism and extremism, and support democratic reforms and human rights. As AFP reported, Kerry planned to visit Morocco and Algeria late last year, but had to change his schedule at the last minute. This trip follows a week-long visit to Europe and Saudi Arabia, during which Kerry made a surprise visit to Amman to meet with Palestinian president Mahmud Abbas to keep Middle East peace talks on track, and is also addressing developments in Ukraine and Crimea. When Kerry arrives in Algiers, he will also co-chair the US-Algeria Strategic Dialogue, launched in October 2012. His Algeria visit comes just two weeks before that country’s presidential elections, where 77-year-old Abdelaziz Bouteflika is seeking a fourth term. Kerry’s visit to Morocco, considered an important US ally in combating radical Islamist ideology, said AFP, takes place less than a month before the Security Council’s annual vote on renewing the mandate of the UN peacekeeping force in Western Sahara.